Thanksgiving is my favorite holiday for three reasons: food, fat tires, and fatheaded friends. Wednesday evening in bed, trying to fall asleep (w/little success), I thought: this is how Christmas used to be. The surprises, the ritual (ride, blab, ride, ad delerium). 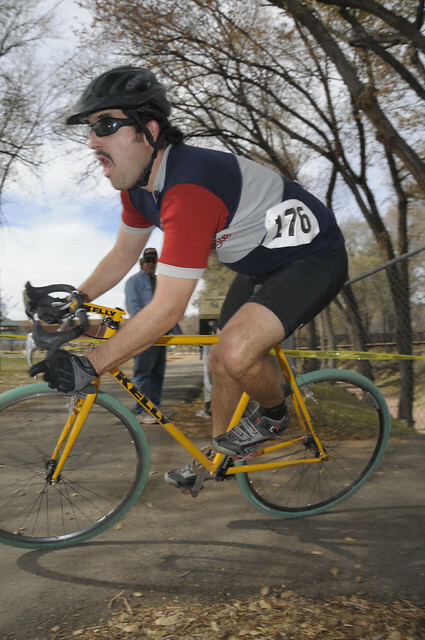 Thursday morning, former Marinite John Loomis was to meet his friend Paul (Bike Intelligencer) Andrews here at eight. But John showed up late… giving me a chance to show the author of the redoubtable blog our tumbledown fief. Then caught up with Lothar (Mr. Loomis) while going hypoxic on the first climb to Azalea Hill. Spotted on the Triple Ripple: the 2.0 verson of Tommy Breeze (taller than dad now!) with his Drake teammate. Also at large: Nicky Fisher in fine flannel fettle. I was talking to Paul who murmured, “that guy who just kissed your neck…looks like Gary Fisher“. It was. What surprised me was that I hadn’t felt anyone nearby. He must have planted it in the ONE spot on the back of my neck (just southeast of the wattles) where all the random smooches land. There’s quite a callous. Joke alert. I bade Gary suggest to a Euro promoter that I go with him to some epic retro ride. When I look at bike magazines, the advertising still only mentions men (like the Kenda tire “Legends of the sport”). Gary, you gotta tell ’em how I inspired your look, and urged you out of the clone zone. Speaking of originals, I saw two riders sporting leopard fuzzy duds (my favorite of a hundred fleece patterns). Each thought theirs was the only one in existence, as did I Yes, I have a set too… Many kids were in full racing kit–Drake High, Redwood, and faux Lance. In fact I’ve never seen so many sub-ten year olds on this grueling four hour loop. In fact, over the decades this ride, while still predominently men, has taken on a strong family flavor. Lovely. Too bad I had to return home early to cook. Fifty hellos greeted me as I picked my way down the rocks. There were still riders noodling up the hill at ten a.m, but the fast majority had gotten started–as is their wont–at seven a.m.
For all those prior years, I’d been lingering on the land too long. With that heavy ol’ banjo, that tea thermos, those cups and those cakes. Missing 2/3 of the actual ride wasn’t as tragic as I’d thought. Just being outside on a fine day makes me ecstatic. But caveat biker: watch where you drop your bike. SeeKay saw a ranger drive over some luckless tandem wheel on the pre-knoll (great reason for riding over to the true Smoker’s Knoll: trucks do not hover there). It’s the second bike he’s seen driven over on the Appetite Seminar day, which is the one day that guys in trucks are swarming around in search of accidents. Ahem. Still, they’re a damn sight safer than the quartet of horsemen who helpfully volunteered to ride (abreast) counterclockwise…to respond to emergencies. If you have ever ridden a fire road enough to know the turns, and you think it’s all clear ahead because you waited until you were alone for a swift section…imagine encountering four guys on horses spread evenly across the fifteen foot road…Ow. But back in town, after I’d cleaned up and put way too much lipstick on: a radiant Mike Posey found me at the beer station,. It had been a while since I danced with his five year old daughter at Kurt & Paula’s wedding. “She’s a speech pathologist, doing great”. Mike owns Ray’s Cycle, a popular Vacaville bike shop, second generation. ~ by jacquiephelan on November 27, 2009. That’s a pretty big smile in that pic. No wonder by the end of the story I could understand. And as a Canadian I thought you were all shopping.